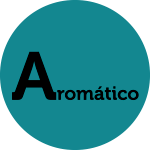 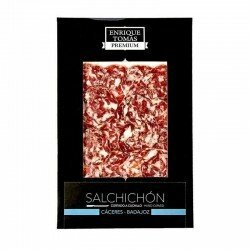 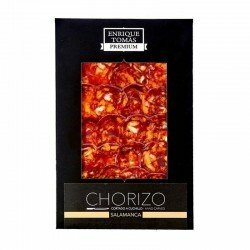 Elegant sachet with 80 grams of exquisite Pata Negra sausage, knife-sliced by professional jamón artisans and with the characteristic flavour of the Extremadura area. This fantastic chorizo is made from the highest quality lean pork parts, selected exclusively for the production of this product. The secret of its quality lies in the meat, which is then seasoned to give it its final touch of flavor, with paprika and spices, according to the traditional recipe. 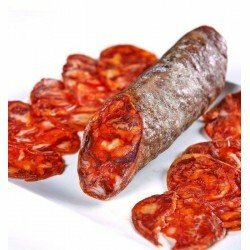 Just like the Jamón Bellota 100% Iberico, the Pata Negra sausages are also a delicacy like this chorizo bellota 100% Ibérico made in Cáceres/Badajoz, don’t mis the opportunity to taste it!